“It was a Monday. I started working early; I cleaned my salon and washed all the towels. When I finished I went to Randle Health Centre and picked up two pregnancy tests. This is the story of Mojisola, (not real name) a 37-year-old lady, hair dresser and secondary school leaver. Moji as she is fondly called by acquaintances spoke exclusively to DAILY INDEPENDENT during an investigative tour of Otumara Community, Apapa area of Lagos. Palpable pains and regrets were still noticeable from her expression as she continued her narrative concerning who was responsible for the pregnancy. She said, “I was raped by some miscreants on my way to my house after work one Saturday. Hardly, did I expect that pregnancy as I was not ovulating at that time. So I did not want the pregnancy. “I was 30 at that time. I continued to sob bitterly. Adegoke was trying to make me calm. She promised to help me terminate the pregnancy. She took me to a Chemist somewhere on Apapa Road. But, this deeply hidden secret later became a public spectacle she bled profusely and was at death’s door. When she next woke up after the ugly exercise, Moji told DAILY INDEPENDENT that she found herself at the Lagos University Teaching Hospital (LUTH), Idiaraba on a drip, breathing from an oxygen mask and running low on blood. Doctors told her she was lucky to be alive. But, her uterus was removed after it became ruptured. Today, she is struggling with infertility. Counterfeit drugs, quack doctors, tea-leaves, knitting needles, even small bottles filled with improvised explosives are inserted into the uterus. Unsafe abortion is a major contributor to maternal mortality. And these numbers are likely to rise following the re-introduction of the Mexico City Policy – a Republican policy that blocks US Government funding to non-US organisations that perform abortion with their own funding, according to health industry analysts. They have condemned the policy which blocks funding to the world’s largest providers of modern contraception, stressing that it is counter-productive. Analysts are worried that the policy has reduced women’s ability to prevent unplanned pregnancies while the number of women undergoing unsafe abortion has increased. This is because of the stigma and misinformation that still surround the procedure. Even in countries where abortion has been legal for decades, abortion often remains a controversial subject with those against the procedure giving political, moral, social, ethical and religious reasons. In Nigeria, abortion is legal only when performed to save a woman’s life. Still, abortions are common, and most are unsafe because they are done clandestinely by both skilled and unskilled providers. The long-term impact of the ‘global gag rule’ has become very visible as family planning providers project that approximately two million women would be denied sexual and reproductive health services as a result of the order reinstated sometime last year. Family planning and global health experts warn that the full consequences would continue to unfold. Marie Stopes International (MSI) which provides contraception and abortion services in 33 developing countries has calculated it faces an $80 million funding gap as a result of the decision, which slashed 17 per cent of its donor income. MSI has already closed some services in these countries. Under the expanded version of the “global gag rule” introduced by President Donald Trump soon after his inauguration in January 2017, foreign NGOs that receive any United States global health assistance are prohibited from performing or promoting ‘abortion as a method of family planning.’ That includes offering legal advice or counseling related to abortion. Some foreign organisations such as MSI have chosen to forgo U.S. funding and continue their work in women’s health – but the loss of resources could result in an additional 2.5 million unintended pregnancies, 870,000 unsafe abortions, and 6,900 avoidable maternal deaths, the organisation claims, leading to a 107 million pounds ($150 million) increase in direct health care costs. “Unless we can fill the $80 million gap created by the global gag rule, it would deprive millions of women of the contraception they need to prevent an unintended pregnancy, and it is the world’s poorest women and girls who will bear the brunt,” Marjorie Newman-Williams, Marie Stopes International’s vice-president, said recently in a press release. Commenting on the impact of the GGR on women and girls, Dimos Sakellaridis, the Country Director, DKT International Nigeria, said it is an infringement on their reproductive health and rights as well as a setback on family planning campaign. “The law has reversed the global progress made on contraceptives, family planning and reproductive health rights. It takes away the option a woman has to decide when and if she wants to have children. Implementers also say it is impossible to estimate the true impact since many aspects are unquantifiable. “The impact is not just about the size of project or country. 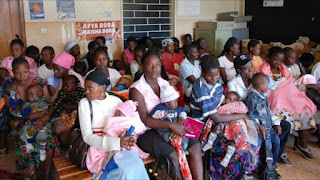 Each individual service works through delivering health care, gaining trust with local communities, advocating health improvements and educating and empowering people to take control of their lives,” according to Rosemary Gillespie, interim director general of the International Planned Parenthood Federation, the world’s largest sexual and reproductive health NGO, which believes it stands to lose $100 million in funding as a result of the gag rule. The fact that the Trump administration’s version of the policy applies to non-U.S. NGOs receiving any U.S. health assistance – rather than just family planning as with previous iterations of the policy – has also made it more difficult to predict the impact, experts say. Recent data from the Guttmacher Institute suggest there remain 214 million women and girls worldwide who want to avoid or delay pregnancy but do not have access to contraception. The don currently with Department Of Obstetrics and Gynaecology, University of Jos and Jos University Teaching Hospital, Jos, Plateau State, laments, “Unfortunately, many young girls and even married are dying in large numbers in Nigeria from unsafe abortion that is clandestinely performed by quacks. On her part, Dr. Abiola Akiyode-Afolabi, Women Advocates Research and Documentation Center, (WARDC) Lagos, laments, the GGR rule has penalised hundreds of Non-governmental organisations (NGOs) and the women they serve in nearly 60 countries across the world. “Of the 40 to 60 million abortions that take place annually, at least 20 million are performed under unsafe, illegal conditions and up to 50 per cent of these women require follow-up gynecological care. Bemoaning the impact of unsafe abortion in Nigeria, she says, “Millions suffer permanent physical injuries, and at least 78,000 women die. Most of these deaths are preventable, and occur in countries where access to abortion is highly restricted or illegal altogether. Painting a gory picture of the consequences, she states, “As a result, one quarter of all Nigerian women who have had an abortion report moderate or severe complications, and two thirds of women who have an unsafe abortion experience serious health consequences. “Every year, hospitals in Nigeria treat approximately 142,000 women and girls for complications resulting from unsafe abortion. Based on recent reports, between 10, 000 to 34,000 women in Nigeria die annually as a result of unsafe abortion.